Just over a year ago, James Lally took over as the athletic director at St. Joseph’s College, Brooklyn. He was extremely eager for the challenge and dedicated himself to improving the overall student-athlete experience at the college. That passion has shone through a year later, as the Bears’ athletic program – a member of the NCAA’s Division III Skyline Conference – is experiencing an unprecedented wave of enthusiasm and success. So far, Lally has enjoyed the intimate relationships he’s built in the small-school atmosphere. Having worked in the athletic department at Hofstra University, Hempstead, L.I., with 350 student-athletes and a staff of 115, he’s relished the chance to work in small group settings with St. Joe’s 145 student-athletes and 40 staff members across 14 varsity sports. Initially, Lally said he was concerned that a smaller staff could possibly preclude him from accomplishing his mission. “I’m a lot less concerned about it now because of the people here,” he said. The staff has bought in to Lally’s philosophy of becoming a fully engrossed NCAA athletic department despite limited resources. Increased expectations became a theme among the Bears’ sports teams during preseason workouts in August. 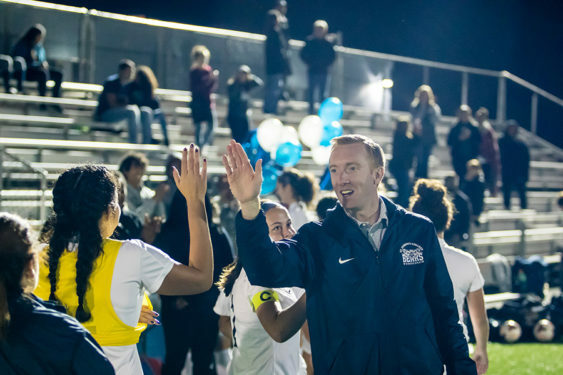 The women’s soccer team followed through this fall, reaching the playoffs for the first time in program history. One of the main reasons the school’s sports program has taken off is the recruiting of local CHSAA student-athletes looking to continue their playing careers in college. Of the 145 student-athletes currently on rosters, 66 – nearly half – played at least one sport in the local Catholic league. Lally has begun accompanying admissions staff members when they visit local high schools. His first stop was a familiar stop: Archbishop Molloy H.S., Briarwood, where he played basketball and baseball and ran track. During the visit, he met with 30 juniors and seniors, telling them about St. Joe’s and how recent Molloy graduates attending St. Joe’s have fared in college. He also mentioned that playing sports for the Bears is basically a continuation of the high-level competition in the CHSAA. While Lally’s passion about St. Joe’s athletic program is evident, the Bears’ student-athletes themselves serve as ambassadors to the program in attracting prospective students. These students routinely head back to their local high schools to tell of the rewarding experiences they’re enjoying playing for the Bears. Lally hopes his current student-athletes with CHSAA ties will continue spreading the word, with his long-term goal being to increase the number of student-athletes at St. Joe’s to 200 over the next three years without increasing the number of sports. The shorter-term goal is for 165 next year, and already that goal is in sight with expanded rosters anticipated in men’s swimming, men’s volleyball and men’s/women’s cross-country, led by the recruiting efforts of new head coach Patrick Goldberg, an Archbishop Molloy graduate from St. Francis de Sales parish, Belle Harbor. As Lally knows well from his days at Molloy, there’s plenty of athletic talent in this area, and he said he’s very fortunate to be able to tap into those resources. But even more so than their athletic gifts, the local CHSAA student-athletes have been molded into great people, which is just as important to Lally and his staff, who will continue to provide these young men and women with every possible resource to help them succeed.